So possibly one of the most exotic 50th birthday we have been asked to do but we just LOVE quirky so couldn’t wait to get on board. 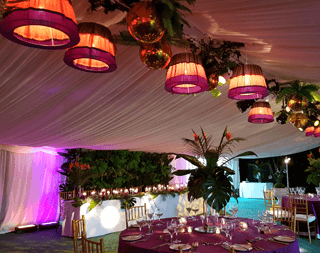 Ama was turning 50 and wanted to do it in style with a big birthday bash at a country house. A birthday bash with a difference, Ama and Swali gave us a brief that they wanted it to be wild and lots of fun, we can certainly work with that. They saw a showcase of ours at the beautiful Highgate House and wanted a similar design but with their own stamp made on it. We met up with them and went through some options and their taste… obviously, we all had a Caipirinha too! The couple wanted something ‘out there’ and celebratory.. none of the usual formalities. Ama really loved the colours she saw of deep purple, gold and orange. She asked for us to create her centrepieces using birds of paradise flower heads, so rich and bold colours were a tick. Swali wanted to really focus on the party with lots of lights and an oil slick black dance floor. 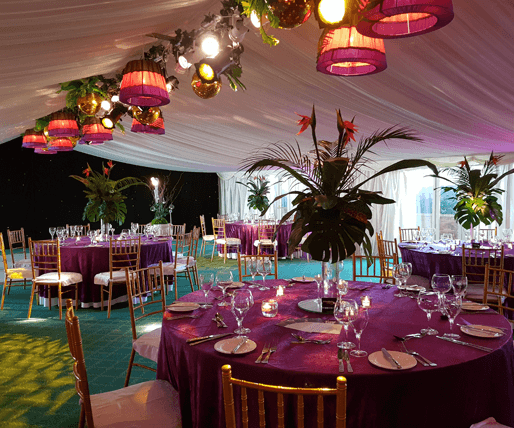 We met up and were very confident in what we had discussed, Karen and Andy started their careers in theming, so for them, this party allowed their imagination to run away. 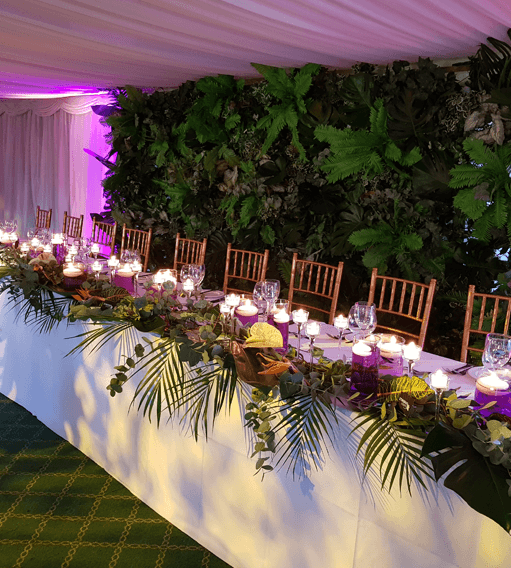 We installed an ivory marquee to create the blank canvas, purple and amber colours washed the walls in up lighting and hanging macramé plant pots floated at the sides suspended from the roof. 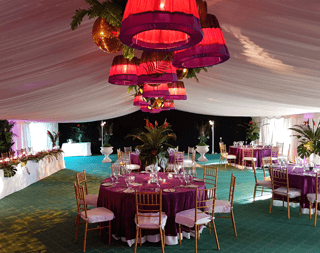 The pitch of the marquee was filled with glittering gold mirror balls, wild green ferns and retro lampshades with vintage bulbs. 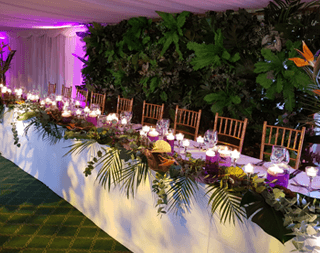 The buffet table featured a living wall behind it with a mix of plants, banana leaves and palms. 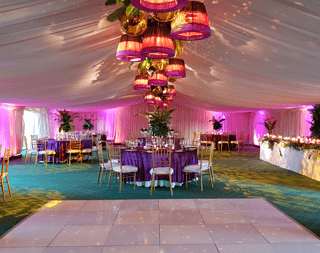 A black twinkling star cloth featured on the wall behind the dancefloor with an over head canopy – creating a separate area for dancing – literally for dancing under the stars. Some moving lights bouncing around the floor created the party vibe that Swali was after. 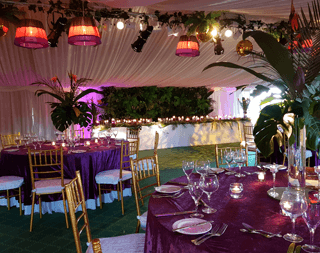 The tables alternated in burnt orange and deep violet crushed velvet cloths of floor length with gold chiavari chairs. 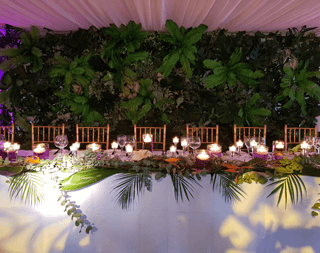 The tall floral centrepieces were filled with hues of greens, purples, peaches and oranges with tall floating candles as satellites around the vase. Some poser tables were placed around the edges of the room to create another space for guests to enjoy on a smaller scale. Ama cut her birthday cake and said a few words… then took to the dance floor where she stayed all night. Their guests partied till gone 3am, asked the DJ for three encores and justified it with the fact that some of their 200 guests had flown from all over the world for this. Canada, Africa, USA, Ireland… all the family, of all ages attended.. and it just goes to show… you are never too old to have a good time!